Chemical procedures commonly require the introduction of heat. This is typically in the form of a hot plate or open flame. While the best place to perform these types of chemical procedures is inside a chemical fume hood, most people are unaware of heat’s effect on the airflow through the fume hood, and the potential impact on containment. 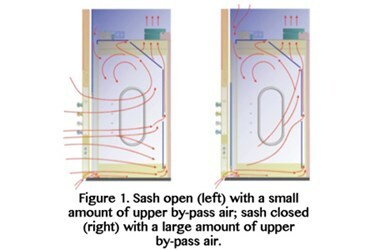 A fume hood under normal operation has air entering through the face opening, as well as through an upper by-pass opening. As the sash is raised, less air enters the by-pass, and as the sash is lowered, more air enters through the by-pass.